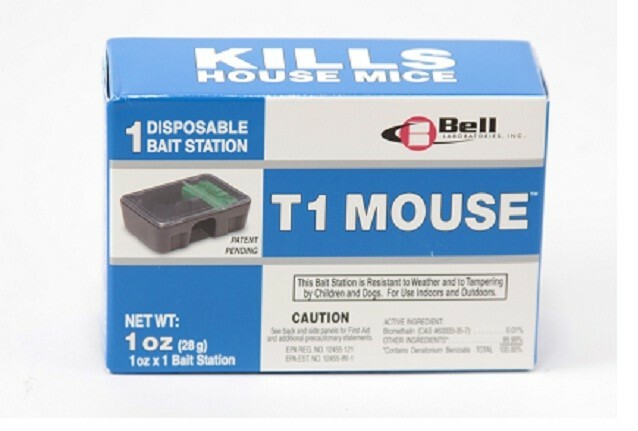 PRODUCT DESCRIPTION: The T1 Mouse Bait Station comes pre-baited with 1 oz of weather resistant rodent bait that uses Bromethalin as the active ingredient. This tamper resistant station offers protection for the bait and should be thrown away once the bait is consumed. For use inside and outside the home, bromethalin is a proven active which is capable of killing target rodents in as little as 2 days. With it's unique "stop feed" action, rodents will stop feeding once a lethal dose is consumed. This enables the contents to affect as many target rodents as possible. WHERE TO USE IT: Place stations in areas where mice frequent both inside and outside around the home. RATE OF APPLICATION: For rats, place one station every 15-30 feet along interior walls, outside foundation walls and within 50 feet of the structure.